The Japan Sel-Defence Forces (自衛隊, Jieitai), or JSDF, occasionally referred tae as Japan Defense Forces (JDF), Self-Defense Forces (SDF), or Japanese Airmed Forces,, are the unified meelitary forces of Japan that war established in 1954, an are controlled bi the Meenistry o Defence. In recent years thay haeve been engaged in international peacekeeping operations includin UN peacekeeping. Recent tensions, pairteecularly wi North Korea, hae reignited the debate ower the status of the JSDF and its relation tae Japanese society. New military guidelines, annoonced in December 2010, will direct the JSDF away frae its Cold War focus on the umwhile Soviet Union tae a focus on Cheenae, especially regarding the territorial dispute ower the Senkaku Islands, while increasin cooperation wi the Unitit States, Canadae, Taiwan, Sooth Korea, Australie, Pakistan and Indie. ↑ "TRENDS IN WORLD MILITARY EXPENDITURE, 2016" (PDF). Stockholm International Peace Research Institute. Retrieved 9 September 2017. ↑ "Procurement equipment and services". Equipment Procurement and Construction Office Ministry of Defence. Archived frae the oreeginal on 2011-01-14. ↑ "Archived copy" (PDF). Archived frae the oreeginal (PDF) on 2008-08-13. Retrieved 2008-08-11. ↑ "Japan - Introduction". Globalsecurity.org. Retrieved 2006-03-05. ↑ "Japan fires on 'intruding' boat". BBC. 2001-12-22. ↑ Herman, Steve (2006-02-15). "Japan Mulls Constitutional Reform". Tokyo: Voice of America. Archived frae the oreeginal on February 16, 2006. 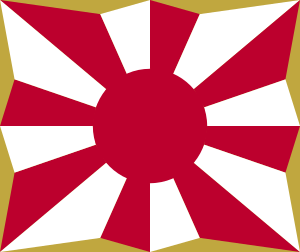 Wikimedia Commons haes media relatit tae Japan Sel-Defence Forces. This page wis last eeditit on 1 Julie 2018, at 14:20.